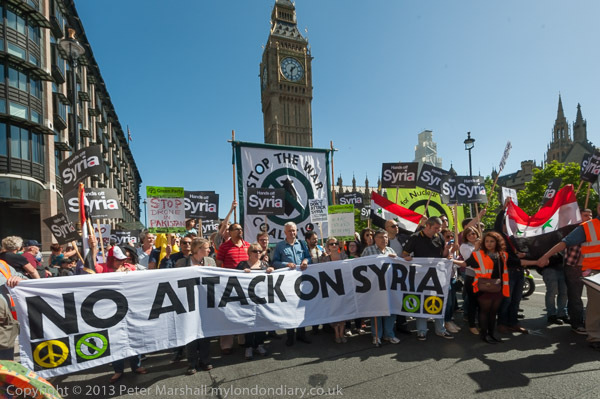 Finally I was back in London on the last day of August, sorry that I’d missed several events, including an ’emergency’ protest called at short notice when US military action against Syria seemed imminent. But action in the UK parliament, or at least a misjudgement by the prime minister, had lost our government a vote on the issue, causing Obama to have to rethink. Speakers at Saturday’s rally suggested it was a great victory for those who protested against military intervention, but the facts don’t bear that out. If Cameron had agreed to the Labour amendment, our parliament would have voted overwhelmingly in favour – if with a little more caution than the PM would have liked. But Cameron appears to have thought he had the chance of a Falklands moment and went for it, only to fall at the first fence. It was perhaps the protests that made Milliband urge caution and to wait until the UN report was available – despite knowing that the UN report would throw little light on the matter, as it was not charged with determining who was responsible. 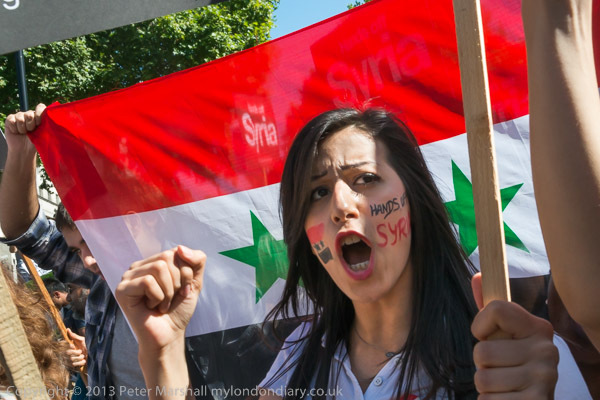 I’m not a supporter of the Syrian regime and Stop the War finds itself with some strange bed-fellows in its protests – as it did over Libya. But military intervention now would certainly not be right or useful. Its also difficult for me to sort out some of the various groups involved. The Alevi are quite distinct from the Alawites though it it is easy to confuse the two, both sects of Shia Islam. 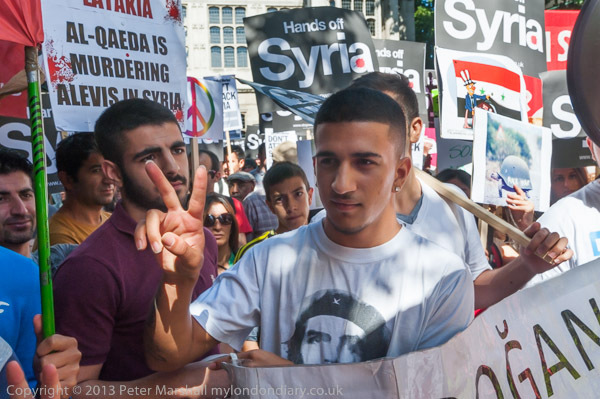 But to find Alevis with a placard ‘Al-Qaeda is Murdering Alevis in Syria’ confuses me. Although Al-Qaeda doubtless would see Alevis as heretical and so to be killed, I understood few if any lived in Syria, though there are plenty of others who they are killing. I try hard to show the different points of view at events such as this, taking care (usually) to frame at least some images so that placards and banners are legible. One problem at this protest was than the main banner was just too long, and very difficult to get it all in a single picture, even with the 16-35mm more or less as wide as it goes, and then only by going back so far that the composition became rather boring and the figures holding it too small. It makes a better picture from rather closer – and the iron grip of more cooperative Stop the War Stewards relaxed just a little for a few seconds to let me take this – but you have to supply your own ‘NO’. 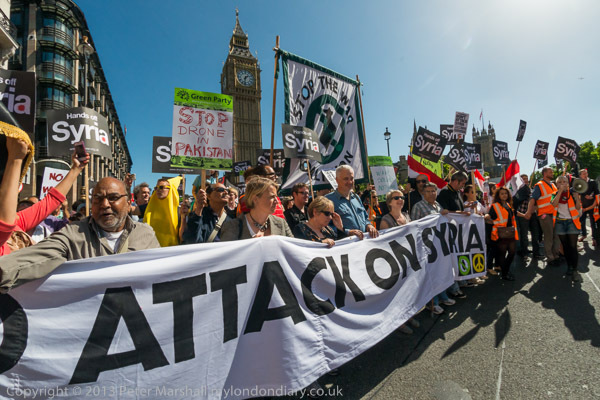 I was able to place the clock tower of Big Ben between the placard and the banner and the figures holding the banner are larger, and the whole image more dynamic. It was taken with the 10.5mm and verticals were straightened with the Fisheye-Hemi plugin. 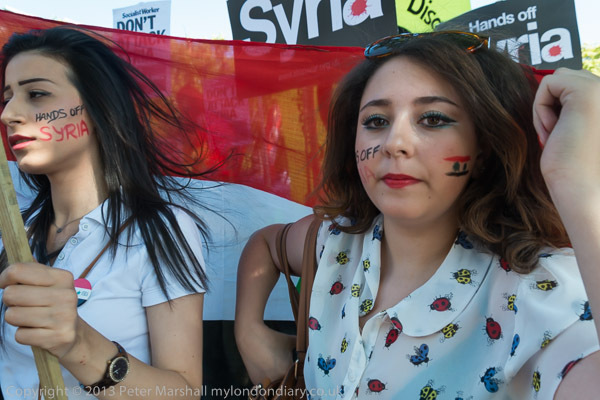 The attraction of the young women with Syrian flags and slogans on their faces was obvious from the start of the protest (not least by the crowd of photographers I found pressing on both my shoulders after I moved in close to photograph them) and I made a few attempts to take their pictures later in the event. My favourite image when I viewed them on the camera back turned out to me not quite sharp enough. Stupidly I was working at ISO 640 and the 1/125 second wasn’t fast enough as I was walking backwards close in front of her – taken with the lens at 38mm (57mm equiv.) It was a bright sunny day, but this image was taken in shadow, and I could well have given myself a couple of stops more to play with. But perhaps it wasn’t really the best picture – those little images on the back of the camera are usually misleading, but the fish that gets away is always larger. There were plenty of other images of her and her friends that I took that were usable. Some at least are probably better. Others are certainly not so good, and at Downing St there was such a mob of photographers than it was impossible to get good pictures. I particularly like another of the same woman, taken a few seconds earlier. I like the tight framing of the second woman, and the kind of visual tension between the two. This is full frame as I took the picture, and possibly I might trim a fraction at the right, where the wide-angle (18/27mm) makes that hand close to the camera just a little too much. 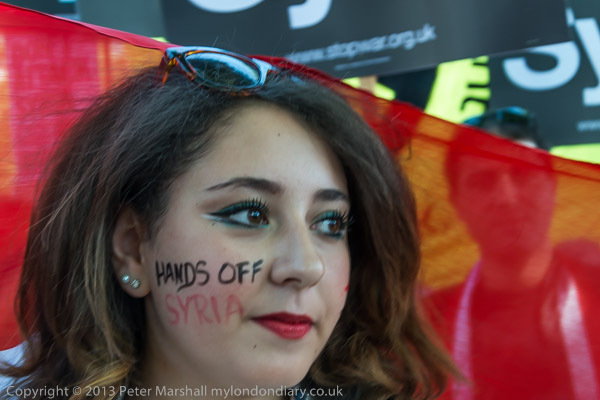 Story and more pictures at Obama Don’t Attack Syria. This entry was posted on Tuesday, September 24th, 2013 at 09:07 am and is filed under My Own Work, Photo Issues, Political Issues. You can follow any responses to this entry through the RSS 2.0 feed. You can leave a response, or trackback from your own site.